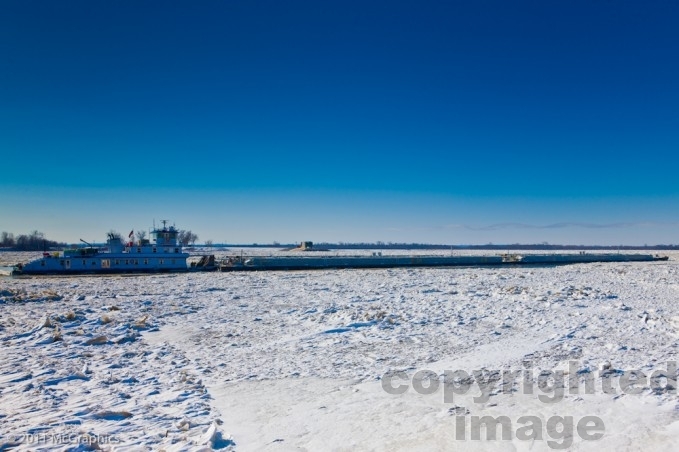 Frozen Mississippi River at Alton Illinois. Alton is a city on the Mississippi River in Madison County, Illinois, United States, about 15 miles (24 km) north of St. Louis, Missouri. The population was 27,865 at the 2010 census. It is a part of the Metro-East region of the Greater St. Louis metropolitan area in Southern Illinois. It is famous for its limestone bluffs along the river north of the city, for its role preceding and during the American Civil War, and as the hometown of Robert Wadlow, the tallest man known. It was the site of the last Abraham Lincoln and Stephen Douglas debate in October 1858. The former state penitentiary here was used during the war to hold up to 12,000 Confederate prisoners of war. Alton was developed as a river town in 1818 by Rufus Easton, who named it after his son. Easton ran a passenger ferry service across the Mississippi River to the Missouri shore. Alton is located amid the confluence of three significant navigable rivers: the Illinois, the Mississippi, and the Missouri. A monument and multilevel observatory, located at the confluence of the Missouri and Mississippi near the levee in Wood River, has been constructed to provide an overview of the Great Rivers area. Alton grew into a river trading town with an industrial character. The city rises steeply from the waterfront, where massive concrete grain silos and railroad tracks were constructed in the 19th and 20th centuries to aid in shipping the area’s grains and produce. Brick commercial buildings are located throughout downtown. Once the site of several brick factories, Alton has an unusually high number of streets still paved in brick. The lower levels of Alton are subject to floods, many of which have inundated the historic downtown area. The flood levels of different dates are marked on the large grain silos, part of the ConAgra mill, near the Argosy Casino at the waterfront. The flood of ’93 is the worst in the last 100 years. The Alton pool runs from the Windfield Dam to the Alton Dam on the Mississippi. This is a excellent place to watch and photograph the barge traffic.